Used for recycling and general waste disposal. 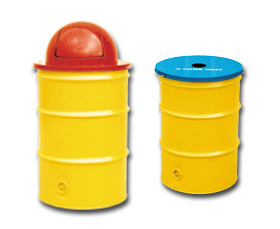 Drum tops are steel cover which fit over 55 gallon drums used for recycling (HCAN-CAP) and general waste disposal (HTRASH-TOP). Features powder coated finish with ultra violet stabilizer and screws for securing cover to drum. Model HCAN-CAPincludes a "Can Only" decal. Units measure 24-1/2" dia. FOB Shipping Point. Product No. Wt. (lbs.) Description Color Opening Size Price Ea.